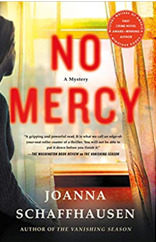 No Mercy is award-winning author Joanna Schaffhausen's heart-pounding second novel. Ellery seeks advice from her friend, FBI profiler Reed Markham, who liberated her from a killer's closet when she was a child. Reed remains drawn to this unpredictable woman, the one he rescued but couldn't quite save. The trouble is, Reed is up for a potential big promotion, and his boss has just one condition for the new job―stay away from Ellery. Ellery ignores all the warnings. Instead, she starts digging around in everyone's past but her own―a move that, at best, could put her out of work permanently, and at worst, could put her in the city morgue. Joanna Schaffhausen wields a mean scalpel, skills developed in her years studying neuroscience. She has a doctorate in psychology, which reflects her long-standing interest in the brain―how it develops and the many ways it can go wrong. Previously, she worked for ABC News, writing for programs such as World News Tonight, Good Morning America, and 20/20. She lives in the Boston area with her husband and daughter. She is also the author of The Vanishing Season.